Axon calibers vary widely among different animals, neuron classes, and even within the same neuron. What determines the diameter of axon branches? We pursue the hypothesis that the axon caliber has evolved to minimize signal propagation delays, while keeping arbor volume to a minimum. For a general cost function, we show that the optimal diameters of mother and daughter branches at a bifurcation satisfy a power law. The derivation relies on the fact that the axon conduction speed scales as a power of axon diameter. Although available data are consistent with the law, there is a large spread in the data. Future experimental tests will determine whether this spread is due to biological variability or measurement error. Minimization of arbor volume and signal propagation delay may have been an important factor in the evolution of the brain. Multi-cellular organisms have solved the problem of efficient transport of nutrients and communication between their body parts by evolving spectacular networks: trees, blood vessels, bronchs, and neuronal arbors. These networks consist of segments bifurcating into thinner and thinner branches. Understanding of branching in transport networks has been advanced through the application of the optimization theory [1, 2] and references therein). Here we apply the optimization theory to explain the caliber of branching segments in communication networks, i.e. neuronal axons. Axons in different organisms vary in caliber from 0.1 μm (terminal segments in neocortex) to 1000 μm (squid giant axon) . What factors could be responsible for such variation in axon caliber? According to the experimental data [4–6] and cable theory , thicker axons conduct action potential faster, leading to shorter reaction times and, perhaps, quicker thinking. This increases evolutionary fitness or, equivalently, reduces costs associated with conduction delays. So, why not make all the axons infinitely thick? It is likely that thick axons are evolutionary costly because they require large amount of cytoplasm and occupy valuable space [8–11]. Then, is there an optimal axon caliber, which minimizes the combined cost of conduction delays and volume? 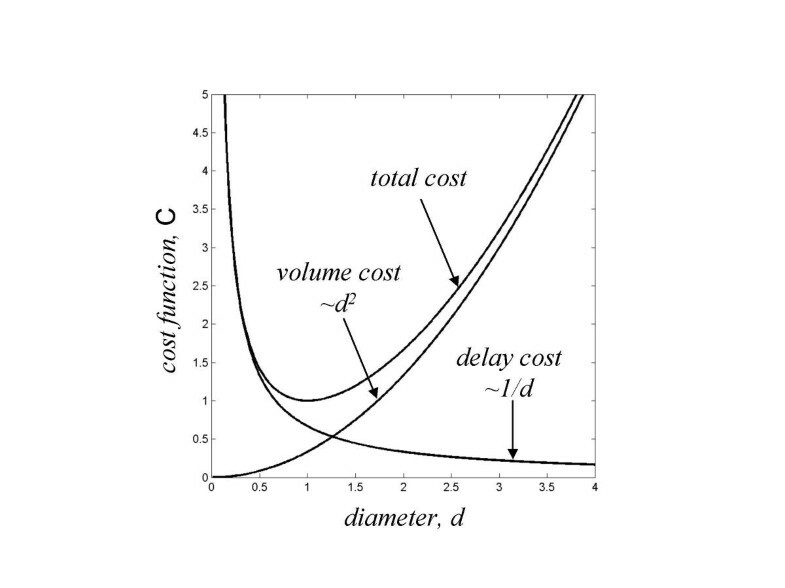 In this paper we derive an expression for the optimal axon diameter, which minimizes the combined cost of conduction delay and volume. Although the relative cost of delay and volume is unknown, we use this expression to derive a law describing segment calibers of branching axons with no free parameters. We test this law on the published anatomical data and find a satisfactory agreement. Here, α and β are unknown but constant (among axons of a given class) coefficients which reflect the relative contribution to the fitness cost of the signal propagation delay and the axon volume. This cost function contains two terms, which have opposite dependence on d, and has a minimum, Fig. 1. Fitness cost of a myelinated axon segment as a function of its diameter. 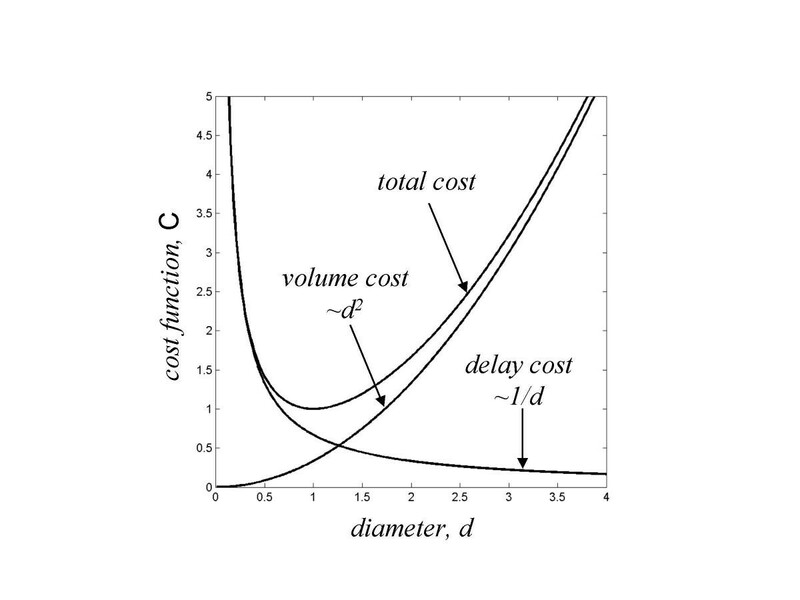 The lines show the volume cost, the delay cost, and the total cost. Notice that the total cost has a minimum. Diameter and cost values are normalized to their respective optimal values and, as a result, are dimensionless. The utility of this result may seem rather limited because the relative cost of time delays vs. volume, α /β, is unknown. A simple axon arbor with a single branch point and three axon segments. Segment diameters are d0, d1, and d2. Time delays along each segment are t0, t1, and t2. The total time delay down the first branch is T1 = t0 + t1, and the second T2 = t0 + t2. Similar expression can be derived for non-myelinated axons (see Methods). In this case, the conduction velocity scales with the square root of segment diameter , resulting in a branching exponent of 2.5. Although the branching law is independent of the relative costs of volume and propagation delay, axon diameters depend on the relative values of α and β. Axons with higher premium on propagation delays (greater α) are expected to be thicker, while axons with higher premium on volume (greater β) are expected to be thinner. Yet the law still holds. For example, if propagation delays to synapses on daughter branch 1 are costlier than to synapses on branch 2, branch 1 must be thicker than branch 2. 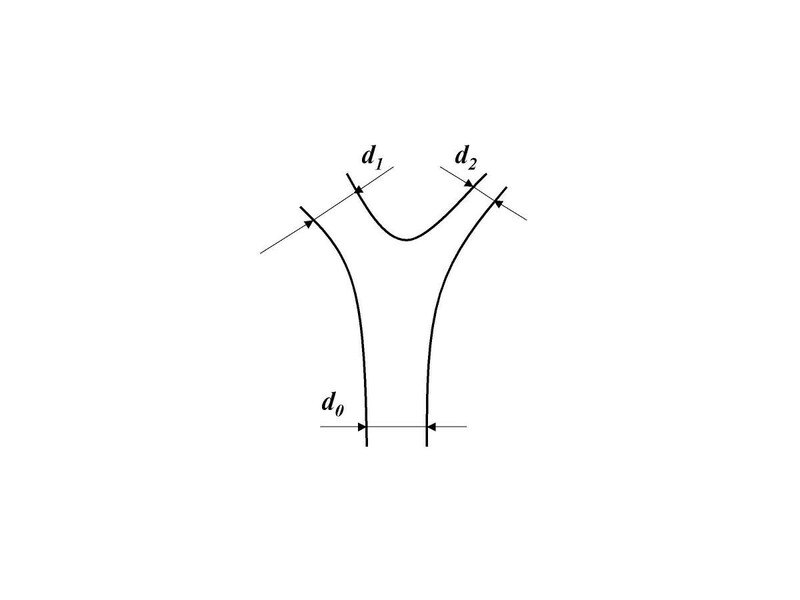 The derivation of the branching law relies only on the assumptions about the scaling of the two costs with diameter. Although existing evidence seems to support both assumptions, more experimental testing is desirable. Also, the range of validity of Eq. (7) is restricted by the biophysical limits on the minimal axon caliber . 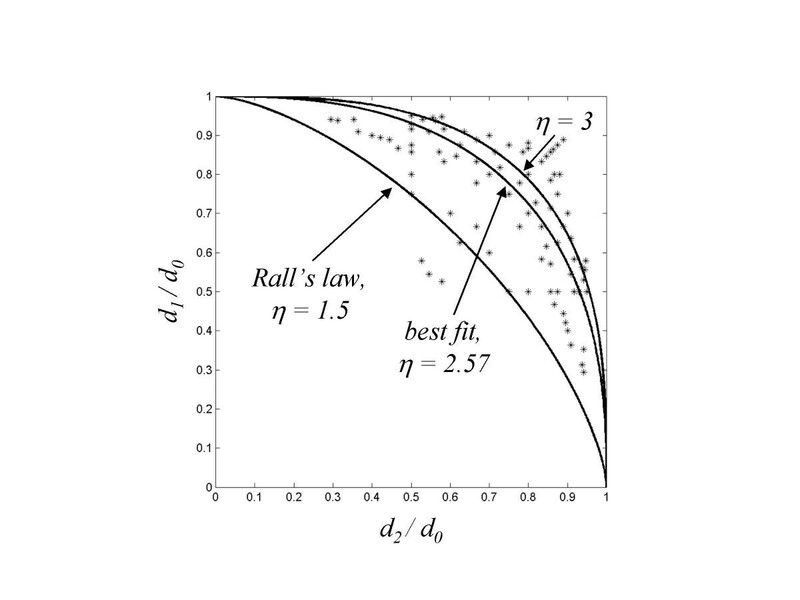 However, the main purpose of Rall's law was to simplify calculations of dendritic conduction rather than to explain the actual branch caliber measurements. Axon diameter may also be dictated by the need to transport material to the synaptic terminals [17, 18]. In this case, one would expect a power law with exponent of 2 . Comparison of the experimental data (asterisks)  with theoretical predictions. Each axon bifurcation (with d1 ≠ d2) is represented in the plot twice. The lines correspond to Eq. 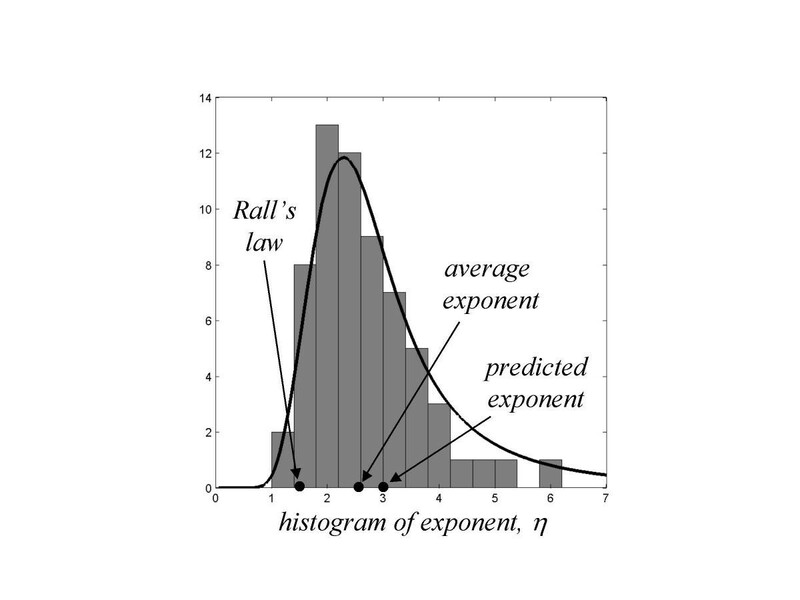 (9) with various values of the exponent: the Rall's law, η = 1.5, the best-fit exponent, η = 2.57, and our prediction for myelinated axons, η = 3.
where exponent η = 3. Despite the large spread in the data it is consistent with our predictions. In fact, the best fit exponent, η = 2.57, is closer to our prediction than to Rall's law, η = 1.5. We also show the histogram of the exponents η obtained for each of 63 branch points from the same data set, Fig. 4. The average exponent, η = 2.67, is much closer to our predicted value for myelinated axons, η = 3, than to Rall's law, η = 1.5. Experimentally observed spread in the branching exponent may arise from the measurement errors. The histogram shows the distribution of the exponent η, Eq. (9), calculated for each axon bifurcation . The average exponent is η = 2.67. The line shows the simulated distribution of the exponent obtained in the presence of measurement errors. Analysis of the experimental data reveals a large spread in the values of the exponent, η. This spread may arise from the biological variability in the axon diameters, other factors influencing axon diameters, or measurement errors due to the finite resolution of light microscopy. Although, at this point, we cannot distinguish between these causes, we performed a simulation showing that a reasonable measurement error is sufficient to account for the spread. First, based on the experimental data , we generate a set of diameters d0, d1 and d2 at branch points, which satisfy Eq. (7). We do this by taking all diameter pairs at branch point from the experimental data and calculating the value of the third diameter according to Eq. (7). Next we simulate the experimental data by adding Gaussian noise to all branch diameters, and calculate the probability distribution for the exponent η resulting from this procedure. The line in Fig. 4 shows that the spread in the histogram of branching exponent could be explained by Gaussian measurement error with standard deviation of 0.4 μm (p > 0.23, Kolmogorov-Smirnov test). This value of standard deviation is consistent with 0.5 μm precision with which diameter measurements are reported in . We note that a similar branching law could apply to dendrites. There, similar to non-myelinated axons, time delay or attenuation of passively propagating signals scales as one over the square root of diameter. This leads to a branching law with exponent of 5/2, which agrees with the measurements done on pyramidal, Purkinje, granule, and stellate cells but not on motorneurons . However, the presence of reflections from branch points and active conductances is likely to complicate the picture. Previously, Cherniak et al. have fitted diameters from a pool of myelinated and non-myelinated axons, and dendrites with Eq. (9). They also found the best-fit exponent η = 3 and a large spread in the data. Unfortunately, they did not attempt to fit the data separately for myelinated and non-myelinated axons. We hope that future experiments will thoroughly test the branching law. One crucial experiment could combine the measurement of the conduction speed exponent, ν, and the branching exponent, η, in the same axons. Another test would be measuring the branching exponent separately for myelinated and non-myelinated axons. We predict different values for the branching exponent because of the difference in ν between myelinated and non-myelinated axons. Also, improving the relative measurement error should determine whether the observed spread in the existing data is biological reality or a measurement artifact. This can be done either by increasing the measurement precision, e.g. by using transmission or scanning electron microscopy, or by measuring thicker axons, e.g. by using marine animals. Starting with the hypotheses that axon arbors had been optimized in the course of evolution for fast signal conduction while keeping arbor volume to a minimum we derived a branching law that relates segment diameters at a branch point. The derivation was done for the cost function of a general form, and relies only on the scaling of signal propagation velocity with the axon caliber. Existing experimental data on myelinated axons is consistent with the law but shows significant spread in the branching exponent. The observed spread may be due to the measurement error or biological variability. If future experiments reveal that the spread in the branching exponent is real, meaning that the law poorly describes individual branch points, the law can still be used in average sense. For example, it could be used to estimate costs of many branching axons in the theory of cortical maps  or in the derivation of larger scale allometric relations . If future experiments confirm the validity of the branching law and eliminate the spread in the data, this law can be used to predict branch diameters. Alternatively, measuring branch diameters would reveal the scaling exponents, which can be used to infer the mechanism of conduction in a particular case. Most importantly, this law provides a deep insight into the design of the nervous system by revealing constraints on wiring, i.e. axons and dendrites responsible for most of the brain volume. The branching law is a quantitative expression of the trade-off between space and time constraints. Finally, optimization approach to brain design helps formulating structure-function relationships, which should provide insight into brain function. with branching exponent η = 3 for myelinated and η = 2.5 for non-myelinated axons. D.C. is grateful to Leo and Boris Shklovskii for helpful discussions. This work was supported by the David and Lucile Packard Foundation and the Lita Annenberg Hazen Foundation.